Nicknames: takao, peppermint, wolfie, vampy (for close friends or family only), pepper, minty. Eye color: Blue, although they look a greeny blue to me...but my family say different. Weight: last time i checked i'm just over: 8 stones. Art Style: Mixed with anime and anthro. Worry's about most: I worry about my Sanity. 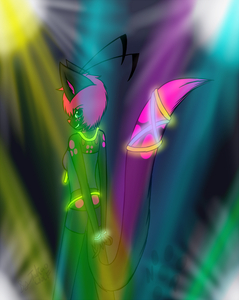 Is doing right now: listening to music and doodling random stuff on sai. My mood right now: bored. do i do Comissions? : nope, although, i do give points to those who can win 10 points from me. do i do Requests? : yes, but for friends only, sorry guys. do i do Trades? : sometimes, i really have to be in the mood to do one. do i OC? : yes i do, i'm always open to oc with others, so note me if ya wonna oc with me, i'm always happy to oc ehhe.